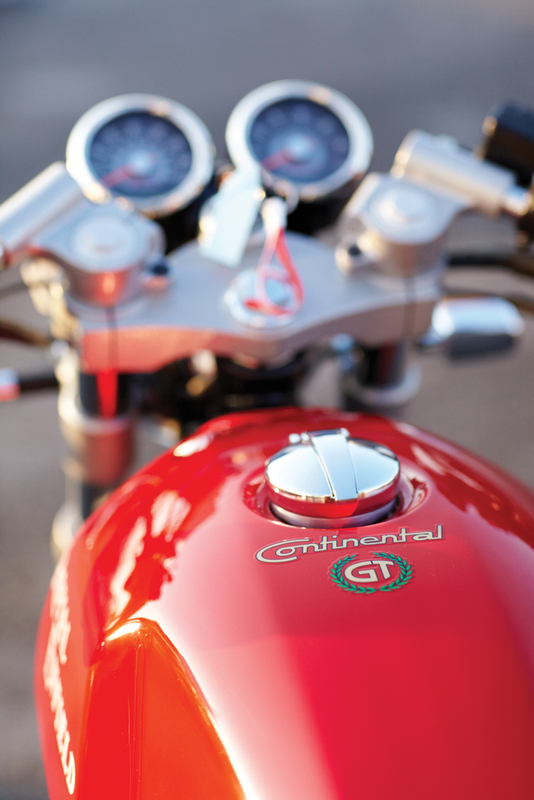 The Continental GT has been Royal Enfield’s worst-kept secret. Ever since the café racer concept was revealed to adoring Enfieldistas at the Auto Expo in New Delhi, in 2012, whispers on the internet and numerous sightings had sustained the hype around the Continental GT. We knew it would have a 535cc mill; we knew it wouldn’t have Ohlins doing shock duty; we knew it would feature a twin downtube cradle chassis crafted by Harris Performance; we knew that Royal Enfield had tipped their hat to their past once again and based the design on the 1965 Continental GT 250; and we knew it would be in red. But, other than a select few, no one had any idea how it would ride. In a cunning masterstroke, Royal Enfield decided to launch the Continental GT at the legendary Ace Café, the spiritual home of the rockers group, on the North Circular road, in northwest London. Early September, on a brisk English morning, the forecourt of the Ace was a sea of luscious red and winking chrome as 40 spanking new Continental GTs were laid out for a bloat of international journalists. The nattiest journos were the trim-waisted Japanese, in their vintage leathers and pudding-bowl helmets, goggles dangling nonchalantly from their hands. Royal Enfield has nailed the retro racer look perfectly. With its low-and-long fuel tank with knee recesses, clip-on bars, the solo seat complete with a cowl, the chrome engine and upswept exhaust, the Continental GT looks like a million dollars. The twin-cradle frame is bookended by a conventional 41mm fork and a pair of preload adjustable Paioli gas-charged shocks. The 18-inch Excel aluminium wheels wear Pirelli Sport Demons (size 110/90-18 front and 130/70-18 rear), which have a period-correct look. Up front, two-piston Brembo calipers pinch a 300mm floating disc, while, at the rear, a 240mm disc and single piston floating caliper help to haul down the bike from speed. There are few things more satisfying in this world than kickstarting a motorcycle to life and hearing the snarl of a well-tuned single (electric start is available, if you must, but remember, this is the Ace Café). The first stop on the ride is Brooklands, the world’s oldest purpose-built motor racing circuit. Brooklands opened in 1907, when the speed limit in Britain was 32kph on public roads. The track has fallen into disrepair, but is regarded as the birthplace of British motorsport and aviation and the site of many engineering and technological achievements. Today, the Brooklands Museum displays a wide range of Brooklands-related motoring and aviation exhibits. A few minutes into my 35-km ride, I had already developed a great appreciation for the Continental GT’s air-cooled, 535cc engine. With the excellent Keihin-FI injection system, nowhere in the rev range did I find any hint of hesitation or sign of a stumble. The comfortable seat isn’t too high (or too low) for my 30-inch inseam; I could plant my boots firmly on the stops. The smallish bar-end mirrors offer an excellent rear view, while the twin clocks provide pertinent information via a pair of analogue gauges and a small LCD display. The reach to the clip-on bars has my torso fairly upright over the tank, but the relaxed, yet not-too-lazy, sporty rear sets allow me to tuck in my elbows and hunker down at higher speeds. Around town, the GT carries its claimed 185-kg curb weight well, providing agile handling. The power of the front brakes, as well as the feel, is excellent and I felt little need to feather the rear disc even in the stop-and-go London traffic. A few runs on the short, usable part of Brooklands’s banked circuit, and we are off to Brighton. We are promised 90km of some twisties and flat-out motorway sections. The Continental GT’s engine has a flat torque curve almost right off idle and it carries through the middle range, giving the bike an easy-to-ride character. The GT’s peak, 29.1bhp at 5100 rpm, is not staggering, but it is fun. With 535cc on tap, the Continental GT is Royal Enfield’s most powerful model, and a lighter flywheel, a larger inlet valve and throttle body and a remapped ECU endow it with snappier acceleration than its predecessors. On the faster tarmac, vibrations kick in at speeds above 110kph and get fairly alarming by 125kph, which is faster than you’ll want to go on this motorcycle, at least, until you find a windscreen or some lower bars to relieve the air pressure on your retro half-face helmet. The braveheart Aussies saw a claimed 145kph on their speedos, but I decided to stay on this side of sanity. The rear dual shocks serve up a shade over three inches of wheel travel out back, and you can adjust their preload. Overall, they are quite effective, at least at soaking up small bumps. Big bumps and quick changes of direction remind you why single-shock rears with more travel and progressive linkages killed off the dinosaurs. But, for 95 per cent of street duty, the GT’s suspension is settled and damped well. Once the pace is picked up on a twisty road, the narrow tire choices make sense. Turn-in is light and predictable, while mid-corner stability is the best I’ve seen on a Royal Enfield. Getting the GT through a turn doesn’t take much effort or thought; it’s just natural, like riding a bicycle. In fact, in terms of ride and handling, the Continental GT is undoubtedly the best Royal Enfield ever. On the highway, the seat is capable of fairly long rides without numbness or discomfort to your backside, as I found out on the ride to Brighton. Every ride is too short when the bike is good, right? Well, I can’t complain, because my small taste of the Royal Enfield Continental GT left me with a very positive first impression. Very few bikes have felt as instantly familiar as the GT did after such a short ride, and the nostalgic cool is just the icing on a tempting cake. Enfield’s modern take on its original 1965 Continental GT 250 isn’t incredibly fast, terribly sporty or amazingly cutting-edge: the new GT is a bike you just hop on like you used to do, especially when you’ve got no particular place to go.